Malaysia Higher Education Loan Fund Project is a program for dispatching students for studying abroad established in 1992, with the loan of Japanese Yen conducted by the Malaysian government. 609 students used this program to study in various universities in Japan. First phase has ended in 2003 after the graduation of the 5th class, but by the support from the people related to the project, 2nd phase began in 1999 April. This second phase’s biggest feature is that education is done in two countries as a twinning program where part of the education is done outside of Japan. By doing so, the cost of studying abroad to Japan significantly decreased, and the hurdle for studying in Japan got lower. In terms of the twinning program, there has been many discussions with 13 Malaysian-government certified universities after 1997 June. It was the first opportunity for foreign students to study in Japan through a twinning program, so there were many issues such as credit transferring, common syllabus, method of education, and remote education between Japan and Malaysia. After this preparation period, in 1994 April, Japanese Yen loan contract was made between the Japanese and Malaysian government, the Japanese Associate Degree program has been established a month later. In the 3rd phase, another contract of Japanese Yen loan has been made March 31st of 2006, and the exchange of contacts has been made in Malaysia. Provide facility and equipment for experiments of engineering diploma. The term of this program was March 2005-March 2014. 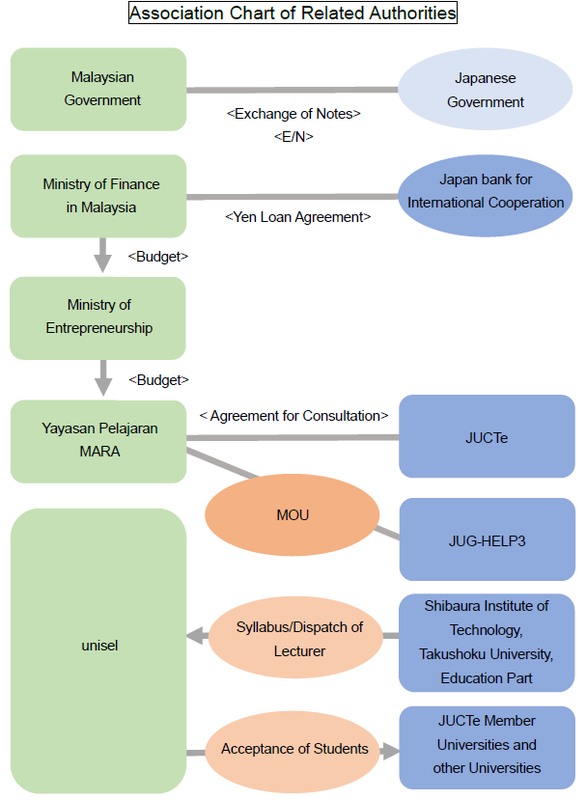 After 2006, the Yen loan contract between Japan and Malaysia was extended, which allowed successful operation of HELP 3. In March 2014, the contract was completed. Preparatory education such as Japanese language instructions and engineering education based on curricula in Japanese universities. Yayaasn Pelajaran MARA (MARA Education Foundation) is a higher educational institution in Malaysia under the Ministry of Entrepreneur Development.